This week it was announced that Heung-Min Son had been named the Best Footballer in Asia for the third time. The award is voted for by journalists based in Asia and Europe and presented by Chinese sports newspaper Titan Sports. The award is to recognise the best performances by an Asian footballer in a calendar year with Son winning the award for 2017 this week. As the award only started in 2013, this means that Son has now won the title three out of the five years that it has been in existence. The other two winners were Keisuke Honda in 2013, and Shinji Okazaki in 2016. This year he beat off competition from the likes of Borussia Dortmund's Shinji Kagawa, Huddersfield's Aaron Mooy and Shinji Okazaki of Leicester City. 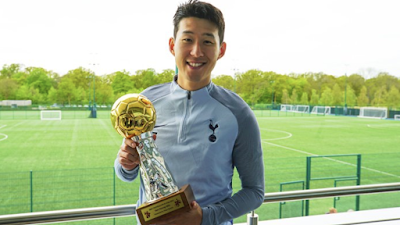 Although the season Son had especially in the Champions League meant he was more than a deserved winner of this award. In other news for the Spurs striker, the South Korea U23 coach Kim Hak-bum came out this week and said he will be looking to select him for the Asia Games. We reported on this story in full back in March explaining how a win in the tournament would mean the player would not have to take up compulsory military service.